Watch Wednesday, March 18, 2015 at 10pm on WMHT TV. "The rich visuals we were able to achieve in IMAGES OF THE ARMENIAN SPIRIT highlight the epic accomplishment’s in Armenian history, architecture and religion and detail the devastation of the Genocide of 1915," said Goldberg. "As a Christian country wedged between the Middle East, Russia, and Turkey, Armenia’s story has tremendous significance in understanding today’s current events." 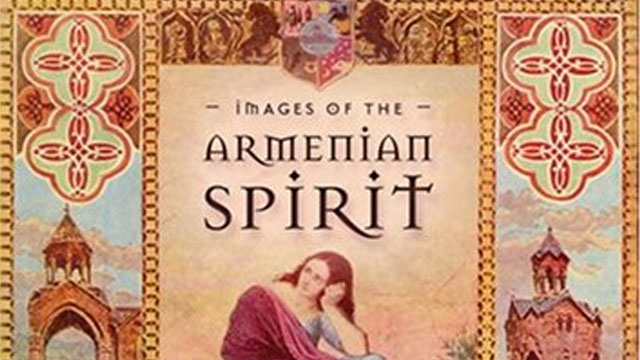 IMAGES OF THE ARMENIAN SPIRIT transports the viewer to today’s Republic of Armenia and, through this journey, explores the spirit of what it means to be Armenian. This is the third PBS special on Armenia produced by Two Cats Productions and, as in The Armenian Americans and The Armenia’s: A Story of Survival, it continues the celebration of this culture’s spirit as well as its legacy of inspiration, achievement, perseverance, and survival. Some of the highlights offered in this documentary include rarely seen photographs of the rescue, by the French, of the Armenian Residents of Musa Dagh during the Genocide, as well as footage shot undercover in Eastern Turkey showing the devastated areas that were once historic Armenia. The film begins with an overview of Armenian lore–which traces Armenia’s origin to Mt. Ararat, the heart of Armenia’s spiritual soul, and to Noah’s Ark. It is punctuated with stories of heroism, such as the legend of Haig and Pel, Armenia’s David and Goliath; and enlightened leadership, including that of the great King Dikran, who successfully protected Armenia from her violent neighbors, the Romans and Persians. As the first nation on earth to adopt Christianity, Armenia’set herself on a course that significantly differentiated and at times alienated her from neighbors. An Armenian Diaspora, or "dispersion," began in the 11th century and continued through the 20th. One hundred thousand Armenia’s who remained in their traditional lands, ruled by the crumbling Ottoman Empire, suffered massacres in the late 1800’s. And, during the first World War came the first Genocide of the 20th Century, with 1.5 million Armenia’s, along with their thriving communities, annihilated. Included in this documentary are rarely seen photographs of the rescue, by the French, of the Armenian Residents of Musa Dagh during the 1915 Genocide, as well as footage shot undercover in Eastern Turkey showing the devastated areas that were once historic Armenia. Still, Armenia was not destroyed. And, as the film shows, with some of the most beautiful footage ever seen today, there is an independent Armenian Republic. Throughout the city of Yerevan, and surrounding countryside, are reminders of Armenia’s ancient heritage and natural beauty: monasteries, churches, memorials, forests, lakes and mountains, all of which resonate with the Armenian spirit. This spirit extends beyond Armenia’s borders into the Diaspora communities, such as Iran, Jerusalem and Georgia, to name a few. IMAGES OF THE ARMENIAN SPIRIT, presented with video, film, still photos, music, and narration is ultimately a celebration of the human spirit and a people that refused to surrender to history.